Beat the butter and add 200gram Sri Kaya Cap Kipas Udang until fluffy and creamy. Add sugar together with ovallete and stirred for 10 minutes. Then, add the eggs one by one. Then, add the flour and Hong Kong flour together with the butter, sugar and mixed together until it smooth. Divide the batter into two parts. Where, for the first part put the yellow color and put green color for the second part. Spread evenly two scoops of green dough on the baking pan and baked in the oven for 8 minutes at 1500C. 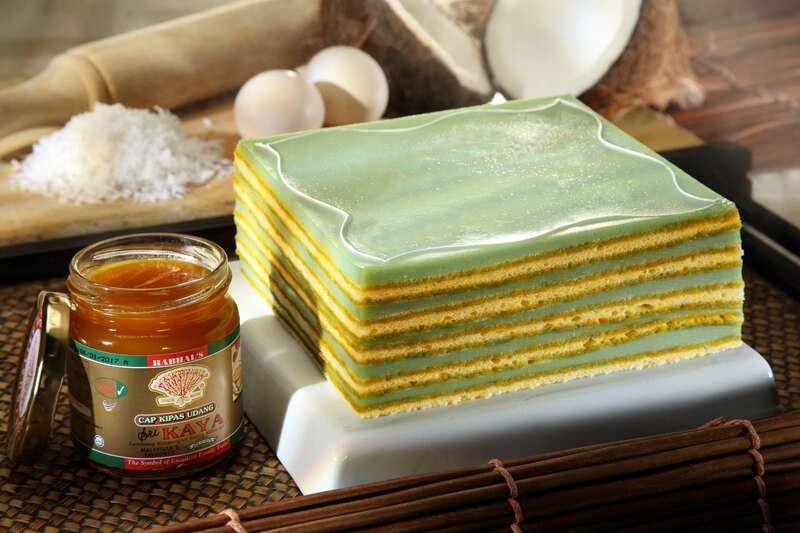 When the first layer was cooked, brush Sri Kaya Cap Kipas Udang on the top of first layer. Then, spread evenly two scoops of green dough on the first layer that already brushed with Sri Kaya Cap Kipas Udang. The last layer will be baked at 1300C for 20 minutes or until the last layer turns brownish color. For the cake layer, you can used either jelly or other edible layer depending on your preferences.